My two girls and I had a great time at WonderCon 2010 in San Francisco yesterday. 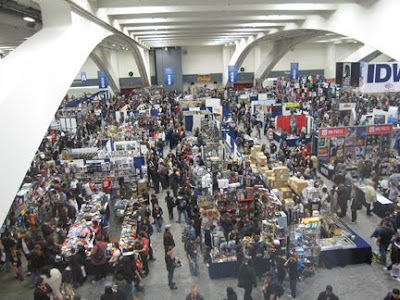 As I'd hoped, it was a smaller, more humane version of the big San Diego ComicCon International, which as I wrote a few posts ago is run by the same group but has gotten so big, difficult and expensive that I'm not sure when I'll be going again. WonderCon proved to be a nicely scaled nearby alternative, definitely scratching my comics convention itch and providing the types of nice moments I've often found at its big brother. It rained in San Francisco Friday, which was the only damper in driving, parking and getting through the front door of the Moscone Center. Can't blame the Con for the weather. The venue had plenty of space for the event, which to my eye took up maybe one-third to one-half the floorspace of the San Diego ComicCon--which still made it plenty big. My girls are more interested in manga and anime, while I'd rather prowl the aisles ogling old comic books and original art, but there was enough of both to keep us all happy. My only small complaint concerned the programming of speakers and panels and such. One, they were hard to find, set in conference rooms on a mezzanine accessed by escalators tucked into distant corners. I think that alone kept the audiences smaller than I expected to find when I poked my head into a couple. Two, there was nothing I really needed to see. Some of that's my fault, some a function of it being a Friday with the good stuff saved for the weekend. That's really less a gripe than a note. Otherwise, no complaints at all. 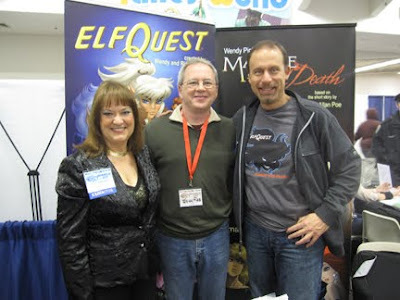 Two of the first people I ran into were Richard and Wendy Pini, the husband and wife team that created the pioneering "ElfQuest" series and continues to do great work. Richard and I began corresponding after he read Whatever Happened to the World of Tomorrow and loved it. I don't mean to brag, but he's a fan. OK, I'm bragging a little. Anyway, I'd never met Richard in person, he had no idea I'd be there, and we had a really nice "reunion." They're terrifically kind and talented people I was proud to introduce to my kids. The Pinis humor a geek. So I'm standing there talking with Richard and Wendy when a man walks up and greets them as old friends. He looks familiar; I glance at his name tag: David Gerrold, science-fiction author and writer of the Star Trek episode "The Trouble with Tribbles." I begged a quick introduction from Richard and scored several Cool Dad Points when I was able to introduce Laura and Robin to the man who wrote their favorite Trek episode (because I raised them right). I'd read a couple of his books and so was able, for the first time in my life, to have an intelligent conversation with a creative-person-I-unexpectedly-met about his work (those types of meetings don't always go well for me). The nice coda to the Gerrold story is that later, when my girls and I split up to do our own things, Robin and Laura were at a table shopping for tribbles when they looked up to see Gerrold talking with the vendor. (And I have to wonder what that would be like for him, to see critters he created 43 years ago for sale at a con . . .) Anyway, Gerrold recognized my girls, nodded to the shopkeeper and said, "Take care of these two. They're friends of mine." Which, you know, is pretty all right. I was able to reconnect with a bunch of cartoonist-types I'd met before, including Shaenon Garrity ("Narbonic") and her husband Andrew Farago, who curates the San Francisco Cartoon Art Museum, Justin Thompson ("Mythtickle"), and Alexis Fajardo ("Kid Beowulf"). The latter two have new books out I was happy to pick up. WonderCon also drew a nice mix of TV and movie celebrities. The Bionic Woman (Lindsay Wagner) sat next to Supergirl (Helen Slater). Funny moment: shortly after arriving, we saw Lou Ferigno (TV's "Hulk") sitting at a table. This is not remarkable. Mr. Ferigno has had a table at every comic-book-type event I've ever been to. You can't toss a light saber at a con without hitting Lou Ferigno. So I'm explaining this to my girls and then start to say, "I'm just surprised we haven't stumbled across Peter Mayhew yet," because if anyone's more ubiquitous at comics conventions than Ferigno, it's the tall Brit who played Chewbacca. And just as I'm saying it, right across the row from Ferigno, we see . . . Mayhew. That's what passes for hilarity inside my head. I didn't meet Mr. Ferigno or Mr. Mayhew yesterday. Here's the deal with celebrities at cons: they're there to make money. I'm sure they genuinely enjoy meeting fans as well, but I don't think they'd appear if there weren't people willing to pay $20 or more for an autograph or photo. Thing is, I don't want their autographs or photos. What would I do with them? When I see someone whose work I've genuinely enjoyed, what I'd rather do is tell them that, say something nice and hopefully knowledgeable about their career, shake their hand, and thank them for being there. That moment means more to me than a signature pushed across a table. On the other hand, I understand and respect the fact that they're not making a dime from it, so I try to make sure I don't take up too much time or chase off paying customers. You'd be surprised how often you can catch a semi-famous person sitting at a table alone. 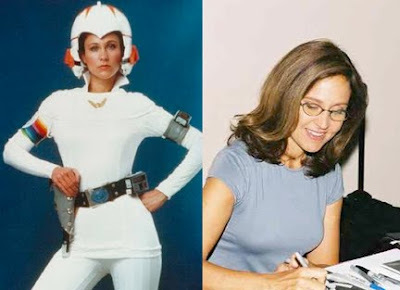 So I was delighted yesterday to have such moments with actors Erin Gray ("Buck Rogers"), Malachi Throne ("Star Trek" and a ton of stuff in the '60s and '70s), and Lee Meriwether (ditto). I also got to meet comic book writer Steve Englehart, who wrote some of my favorite comics when I was a kid. Bought some books, met some people, made some friends. To me, that's a successful convention and a really nice day. I expect I'll be a WonderCon regular. That's a great story about David Gerrold (isn't Tribbles everybody's favorite episode?) In the photo, though, the two of you look enough like brothers that you could have passed him off as such. You had some one-to-one time with Lee Meriwether? Wow. As you may know, I taught at CCSF for nearly 20 years, and she was one of our two most famous alums. We don't talk much about the other one anymore, but he transferred to USC and had some success on the football field, where he wore number 32. Holy smokes - David Gerrold and Malachi "Look, Al, I'm not asking you to spy -- I'm just asking you to steal" Throne on the same day! Awesomeness. High fives and fist bumps aplenty, dude. geek-o-meter is pegged right now. No telling when it will return to baseline. Sherwood: Actually, Tribbles isn't my *favorite* favorite episode, but it's one of my Top Six for sure. My conversation with Ms. Meriwether was interesting and unique: I had a late great-uncle who owned a charter boat on S.F. Bay and always told stories about how Lee Meriwether worked for him when she was a high school student. I couldn't pass up a chance to run it past the primary source. She said she vaguely remembered my uncle's name but couldn't place him, and was sure she'd never actually worked for him. Maybe, she suggested, she'd done some modeling on his boat. Intriguingly inconclusive. She was a lovely woman, even while gutting a cherished family tale. Anon: You and me both, brother. Or sister. Brian, my only Star Trek Guest Star hero moment was in 1980, when I met Commodore Decker himself: William Windom. "The Doomsday Machine" is my favorite episode, bar none - and that's including COTEOF and BOBW I&II. Not sure if this takes image includes but here's a link to the picture of me and WW during a SAG/AFTRA strike in front of Universal Studios. Behind on comments because I've been traveling. I loved the Gerrold story!!! Especially him giving props to the girls later. "The Trouble with Tribbles" is, without a doubt, my favourite Star Trek episode. I would've asked him to autograph my hand, and never washed it again. 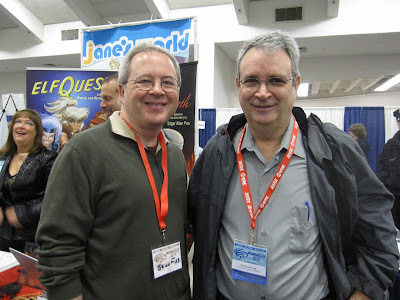 I will always be envious that you met David Gerrold. I, too, read his TROUBLE WITH TRIBBLES book. I still have my rather worn first edition Ballantine Books paperback I shelled out $1.50 for at a Rexall Drug Store in 1973. And Malachi Throne! And Lee Meriweather! Wow. I'm in awe here. Oh, yeah. One more thing: What, pray tell, are your top 6 TREKs? Jim: Great picture! Young You looks like a cool kid. I always heard Windom was a real sweetheart to fans, I hope your meeting was a good one. Ronnie: Tell you what: I'll leave my Gerrold-shaking hand unwashed, then when you and I meet in real life someday I'll pass it on. Mike: Good to hear from you, pal! I read Gerrold's two Trek books, Tribbles and "Worlds of Star Trek," cover to cover more times than I can count. These darn kids these days with their Intertubes can't grasp how slim the fan pickings were in the '70s. 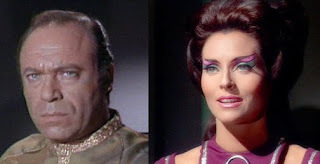 I also love "Space Seed," but more for what it inspired later than the episode itself. My number 1 and 2 rankings are firm, but ask me on another day and 3 through 6 might be completely different. Plus there are probably 5 tied for 11th place. "Squire of Gothos," for example, because I think this is the earliest exploration of a Q-type character. And the eternal "Hot Girls Who Just Need Some Kirk Attention" episodes, like "Gamesters of Triskelion" or "By Any Other Name" which have little redeeming social value but much anticipatory wardrobe flimsiness. It's easier to do the bottom of the barrel list: "Spock's Brain" and "Turnabout Intruder" - most of the 3rd season is filled with Voyager-level embarrassments.